Julian Vignoles, the head of the Irish delegation, says having to host the contest would be a “headache but a privilege”. 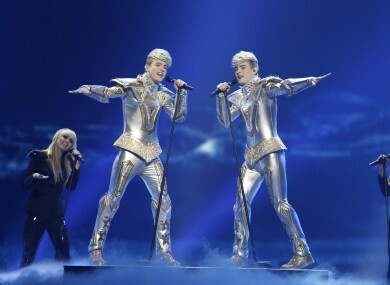 THE HEAD OF RTÉ’S delegation to the Eurovision Song Contest has admitted his relief at not having to organise next year’s contest, after Jedward failed in their second bid to win the contest in Azerbaijan on Saturday. Julian Vignoles, who is RTÉ’s assistant commissioning editor for factual programmes, said having to host the contest – which is an obligation of the national broadcaster who wins the previous year’s contest – would be a “headache”, though also a “privilege”. Vignoles told RTÉ’s Morning Ireland that the contest is significantly more demanding to host now than it was when Ireland last played host in 1997 – with the number of participating countries almost doubled, requiring the introduction of two semi-finals. Because this rule no longer existed, many countries with lesser spoken languages instead submitted their entries in English – meaning Ireland’s advantage of singing in a well-known tongue was diminished. RTÉ would discuss a potential change of approach to the contest “in the next few weeks”, he said. Sweden’s victory in Saturday’s contest also averts a potential accommodation headache for Dublin: the European Broadcasting Union had already fixed the date of next year’s contest for Saturday May 18, the same day that Dublin hosts the final of rugby’s Heineken Cup. With Dublin also hosting the final of the Amlin Challenge Cup on the Friday night, as well as visiting delegations and supporters from as many as 43 other EBU members, it may have proven difficult to find enough accommodation in Dublin to cater to demand. The availability of a venue would also have posed difficulties – with Dublin’s O2 arena only able to host 9,500 people during regular all-seated events, a number which would likely fall given the massive front and backstage organisation required for the contests. By comparison, Baku’s Crystal Hall was able to hold around 20,000 people for Saturday’s contest – even with its capacity limited by the inclusion of the ‘Green Room’ in the arena’s main auditorium – while Dusseldorf’s Esprit Arena, which hosted the 2010 contest, holding over 60,000. The cramped capacity of The O2 would possibly require RTÉ to host the contest in a stadium – which would probably require special dispensation from the EBU, which requires venues to be indoor. With the Aviva Stadium out of action for the Heineken Cup, RTÉ could have been forced to rent Croke Park, potentially for up to a fortnight – and then face the prospect of having to install a temporary roof on GAA headquarters, which would also require planning permission. “People say Croke Park, but of course you would not fill Croke Park, probably – and certainly wouldn’t fill it for the semis,” Vignoles said this morning, adding that an outdoor event would mean a daylight broadcast while most of Europe was in darkness, and would also present the possibility of poor weather. Email “RTÉ's Eurovision chief admits relief at not having to host 2013 contest”. Feedback on “RTÉ's Eurovision chief admits relief at not having to host 2013 contest”.